Ascents and Descents in Realtime, Ahipara, Northland, Aotearoa, New Zealand, 22.03.08 (version 1 of 2 HD) from Alex Monteith on Vimeo. 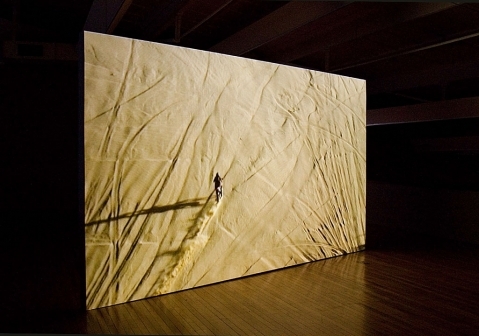 Ascents and Descents, Alex Monteith, 2008 from Alex Monteith on Vimeo. Moto-x riders attempt to ascend the huge fifty-degree (steep incline) dunes near Ahipara, Northland. The work is a single realtime take of the riding antics of moto-x and raptor/quad bike riders. The audio is diagetic stereo sound. Four minute excerpt from the 18 minutes of actual installation video channel. Two minute compile of documentation of the video installation intercut with raw footage of the Moto-X project in the Need for Speed exhibition, St Paul St Gallery, Auckland, Aotearoa, New Zealand, 2008.